It’s been awhile since I’ve given you a pictorial post and added the captions, so I thought it was time. 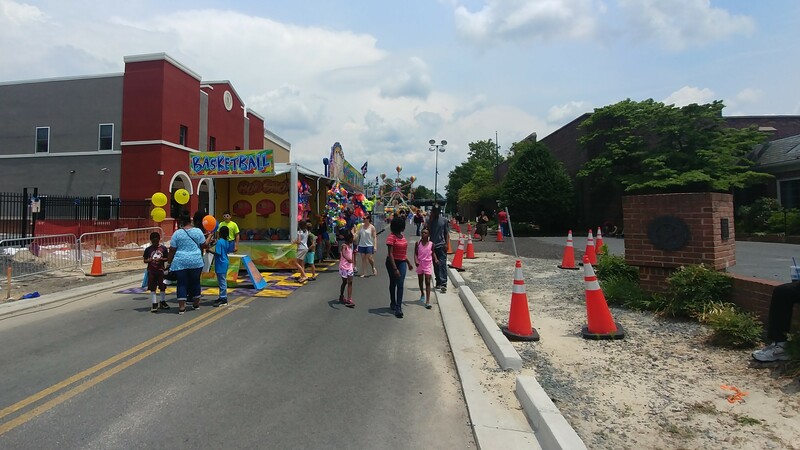 It may be an unfair comparison – the reboot of a longtime staple of Salisbury cultural diversions against an established old favorite – but I have to wonder just went wrong with the Downtown Salisbury Festival, which seems to me somewhat of a failure in its new time slot of early June. I will say, however, that weather probably played some role: while I was taking these photos at the Downtown Salisbury Festival, Ocean City was getting a historic deluge of rain. Salisbury was hit by the next line of storms a couple hours later. Yet I don’t think it was all about the weather. Looking eastward along Main Street to the narrow row of rides that spanned a block. I turned around and looked westward down the next block. Still not much traffic. It was a little better down the block. 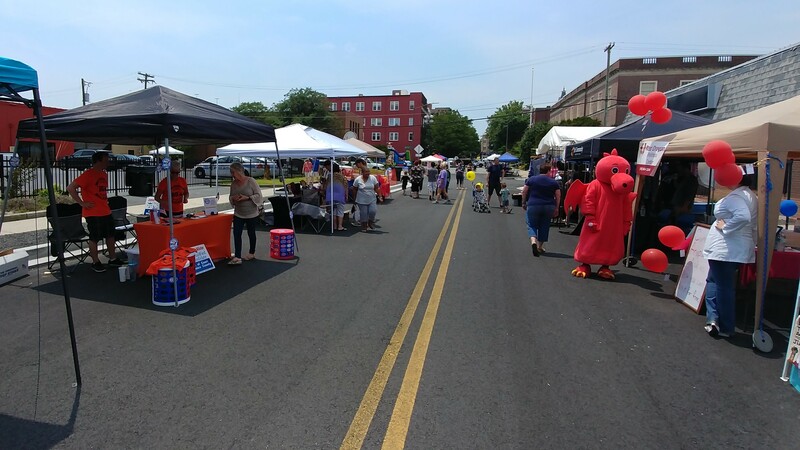 Since it’s political season, it should be noted the tent on the left (with the orange-clad folks) belonged to the Clerk of Courts campaign of Bo McAllister. But as you worked westward on Main Street, the crowd thinned out. On the left is the luckless campaign of Democrat Michael Brown, a Salisbury resident running for the right to challenge incumbent Andy Harris. This was from the west end of the art area. It’s hard to see them, but the local Democrats were camped out in front of the Chamber of Commerce building on the right, without a tent. In future years, it’s likely the DSF will be centered along the riverfront and the amphitheater under construction. But construction wasn’t done for this edition. 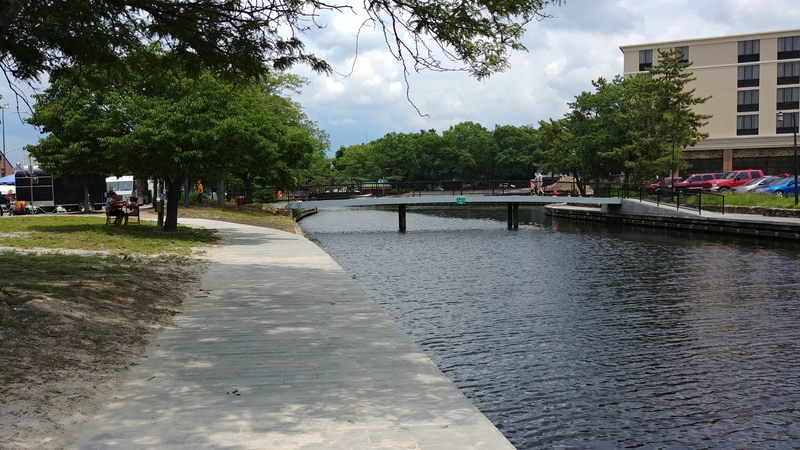 Another photo along a deserted riverfront. Some of the food court was along the river side. The food court had plenty of choices, but didn’t have much business. 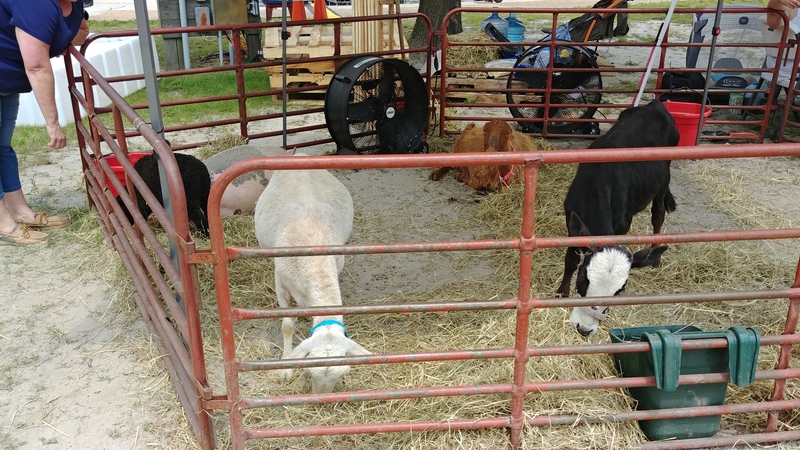 At least there wasn’t a line for the petting zoo. I’ll grant that I wasn’t there for the DSF on Friday night and the crowd may have been better. But I think in the future they’ll either need to condense the event a little bit or perhaps institute a shuttle to ferry people from stop to stop – maybe 3 or 4 stops. I didn’t think late April was a really bad time to have it, either. On the first weekend in June people are thinking about graduations or the beach. 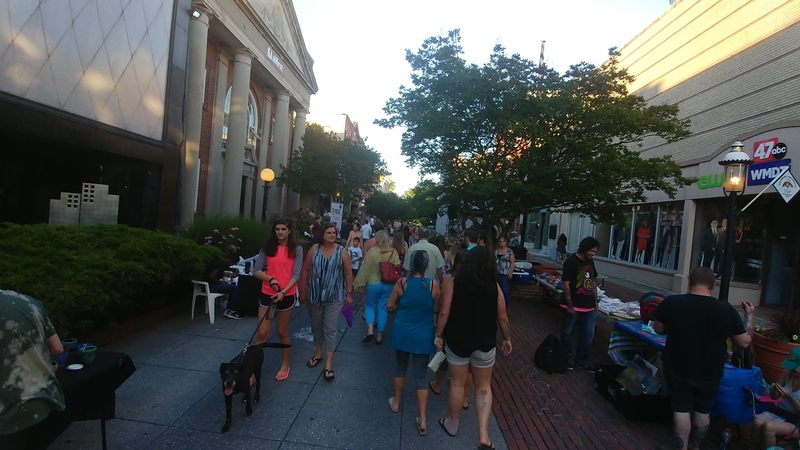 Conversely, the weather was picture-perfect Friday night for Third Friday and people responded. I walked onto the Plaza and what did I see? Lots of people! The event was also hot and cold running politicians. 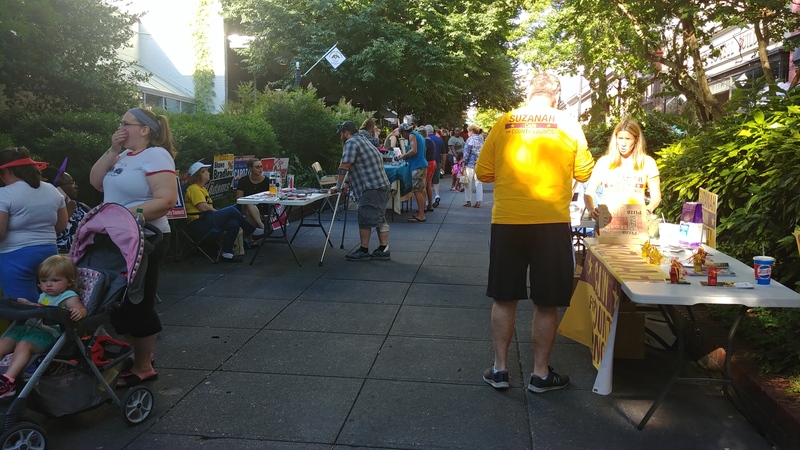 The local GOP was set up across from District 4 County Council candidate Suzanah Cain. On the other side of the spectrum, we had the Lower Shore Progressive Caucus a couple spots in front of County Executive challenger Jack Heath’s spot. It’s also noteworthy that Suzanah Cain’s opponent Josh Hastings was walking about with his sign. My friend Sarah Meyers has a cool job: she’s the curator of Poplar Hill Mansion. She was out at 3F promoting their festival next Saturday, the 23rd. This month’s theme may have helped with the promotion: people were encouraged to bring their dogs. They could have partaken in this course. Even at 7:30 there was still a serious crowd out there. This month’s band was one of the better ones I’ve seen. Muskrat Lightning was the band, making a great soundtrack for the event. 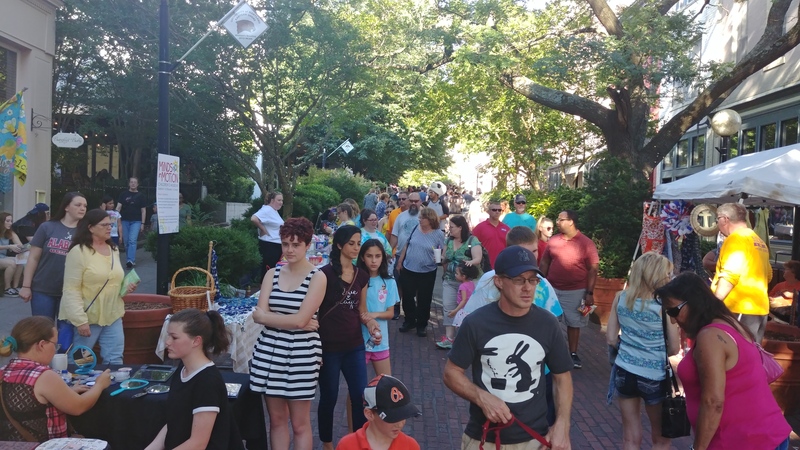 It took several years for Third Friday to find its stride, so perhaps I shouldn’t be so hard on the Downtown Salisbury Festival. But I remember when they tried to use most of Main Street and being so spread out meant something was shortchanged. It’s become successful since they focused on the Plaza and the Division Street side of the courthouse. 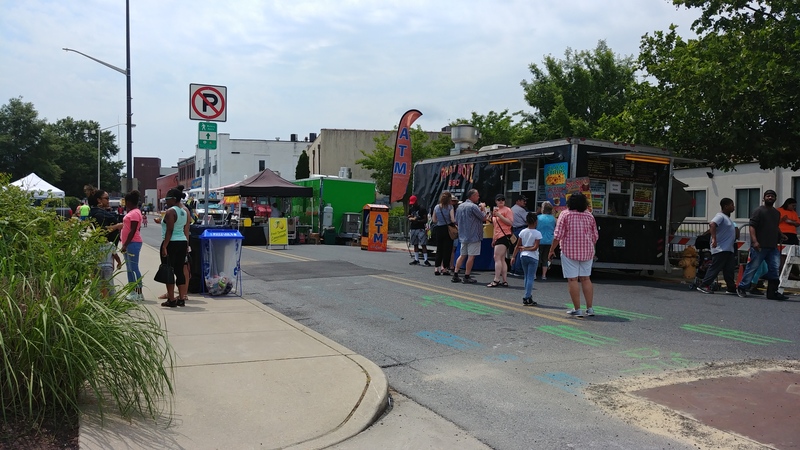 So if the DSF wants to take advantage of the riverfront, maybe they need to place the exhibitors where the food court was and use one of the side streets as a food court. There was a visual effect missing on this layout – if you were at the rides or checking out art vendors you wouldn’t be aware of the food court or stage, which made the event seem small. It needs to be tied together better, and maybe having the amphitheater done will help in that regard. 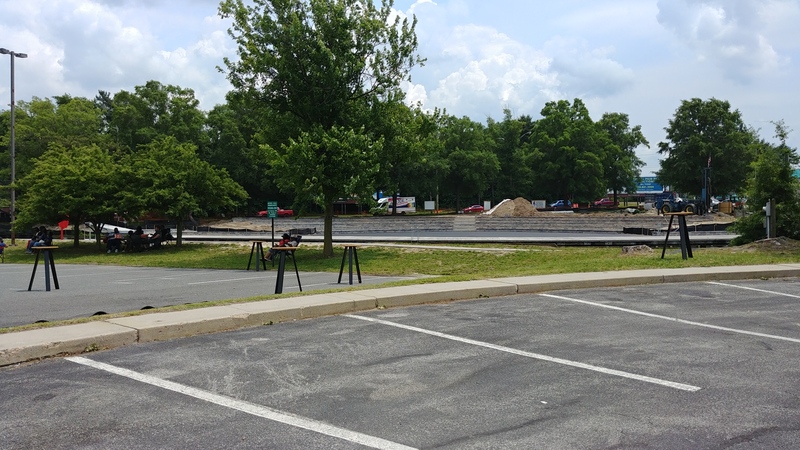 I guess we will find out next year for the DSF, as well as the First Saturday and Fridays at Five events – the latter two on hiatus for this year as construction occurs at both sites. Maybe we will get better weather, too. 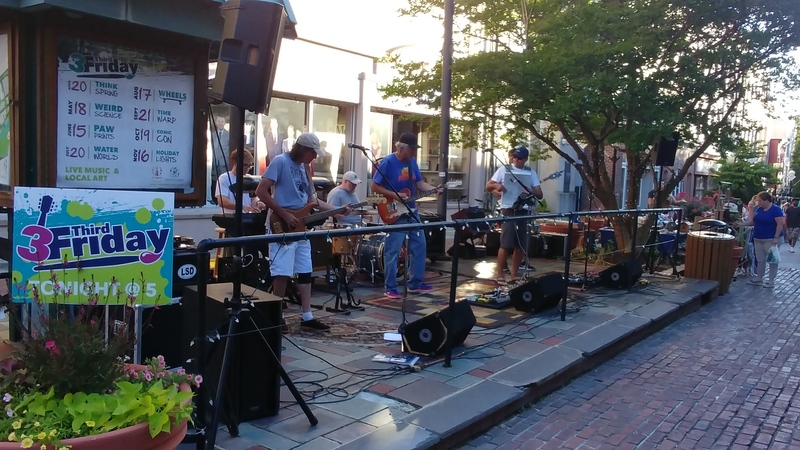 Unlike a number of the most recent previous renditions for this long-running series, this will feature four performers at three different venues in and around downtown Salisbury on consecutive days last weekend. It would have been five but the featured group from the local Academy of Music Performance was just wrapping up when we arrived. So I wasn’t intending to do a WLR when we decided to eat outside at Roadie Joe’s afterward, but it turned out Kaleb Brown was playing and you know me – I like listening to music and taking pictures. So it was just Kaleb, his guitar, and his beatbox (that would drive some of the dogs still around from 3rd Friday crazy) and that reggae sound he likes to do. Good dinner music on a lovely summer evening. I think the band wasn’t supposed to start until 10 but they got an early start. We had just finished our dinner and were ready to leave when we decided to stay for a couple songs from Naked Nation that turned into half a set. Naked Nation seemed to have a little different playlist than other cover bands, doing a wide range of songs that are not really classic rock and range more toward Top 40 alternative stuff. But the people were getting into it. So Saturday came and I decided to head back downtown for the Salisbury Shore Craft Beer Festival. Headlining the event was Eastern Electric. Now I like Eastern Electric, but it didn’t dawn on me that there was a band also playing in Headquarters Live called Billy Earl and the Pink Flamingos. So I checked out the location and the band. Admittedly, their style of music isn’t my cup of tea – but it does allow them to put a different flavor on songs like Chris Isaak’s Wicked Game. They can still make it sound hauntingly lonely. Meanwhile, back at the Beer Fest Eastern Electric was doing their set mixing covers from several eras and some originals. One of those was their closing song (and one I really like) called To Heaven Before The Devil. “I hope to get to Heaven/Before the Devil knows I’m dead.” It’s a rollicking mix of rock, blues, and country that represents the band pretty well. 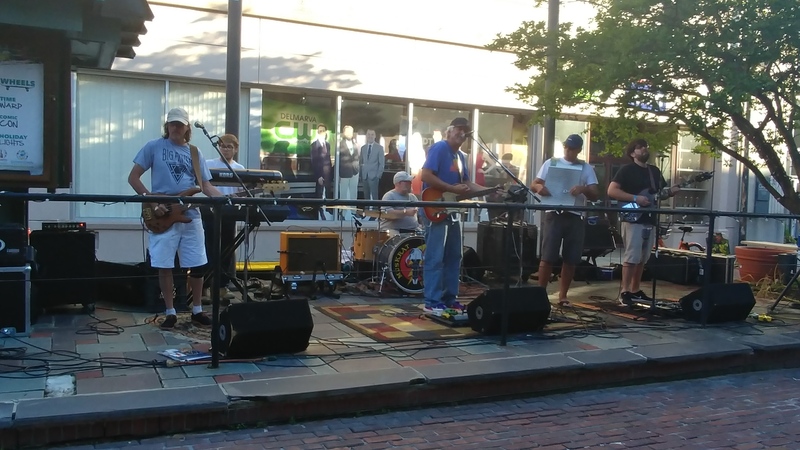 And as Eastern Electric singer Nate Clendenen put it, last Saturday was a nice occasion to hang out downtown – they’ve been trying to redevelop it “since I was in fifth or sixth grade” and it finally is taking root. So it was truly a weekend of local rock, as all the bands came from this part of Delmarva. It’s worth reminding people that our little corner of the world has musical talent. All it needs now is the audience to appreciate it. It was an event which was supposed to occur on a Monday night back in January in a completely different venue, but as has been the case before with Bob Ehrlich we all had to wait until the weather thawed before Wicomico County Republicans could hear from him. As part of what he billed as a 16-state tour for his third and newest book, Turning Point: Picking Up the Pieces After Eight Years of Failed Progressive Policies, the former governor made brief remarks then commenced to signing copies for a crowd of close to fifty people. Calling the book an “eight-count indictment of the Obama administration,” Bob remarked that some of his favorite stories, which come from a volume that’s a compilation of his writings over the last several years from a number of sources (with a couple of original, previously unpublished portions added in) were the open letter he wrote to his son about marijuana laws and his interactions with some of the offenders. Two common elements he found among those who had been caught and imprisoned for drugs were the lack of a father figure at home and that they got their start with marijuana. However, Bob was careful to note that not everyone who used marijuana was a criminal. A second favorite was the chapter on political correctness that he wrote to be humorous, but are instead being reflected in today’s headlines. He implored the college students in attendance not to placate those who get overly worked up about “safe spaces” on campus. There were a lot of books being signed and plenty of people had their chance to pose for a photo with Bob. I’m going to borrow Dave Snyder’s picture here, which I got from social media – the snapshot I got of Bob signing came out too blurry. My chat with Kefalas was rather brief, as he was obviously concentrating on circulating around, but in conversations I had with his campaign staff I gained a little perspective on his ideas and shared some of my own. To me, Chrys’s job if he wins is to concentrate on making conditions better for the country as a whole: more beneficial trade pacts, a decrease in taxation and regulation on a federal level, and working to leave government as the least of our worries. It would then be incumbent upon the Hogan administration to make Maryland more competitive against its neighbors and other states because the federal government would simply create the best possible conditions for any American company to succeed. Once Ehrlich left, the party began to break up. But if I may make one observation regarding a summerlike evening in the midst of an early spring: walking out of Roadie Joe’s they had a musician outside. I turned the corner and could faintly hear something down at Brew River only to arrive at the parking lot where I had parked and hear some very good band over at Headquarters Live. I was standing at my car literally listening to three different venues, all opened up. Downtown Salisbury’s not just alive on 3rd Friday anymore, folks. And speaking of music, it gives me a good segue into letting you know monoblogue music will be back tomorrow after its winter hiatus. It’s someone you’ve heard from before with something new. A new Day in Salisbury? It was apparent from the start that Jake Day was a guy in a hurry. Not content to learn the ropes as a member of Salisbury City Council, he ascended directly to its leadership. So I’m not really surprised that he made his expected run for mayor of Salisbury official earlier tonight at Headquarters Live. Yet there are some things which stick out about Day’s agenda and record which I find to be of concern. It’s possible he may have addressed these in his remarks, since I was not at the event, and he may certainly feel free to comment here. But I would like to know first of all what he plans to do to keep up Salisbury’s neighborhoods and not create a city full of red-headed stepchildren to the spoiled brat of downtown. Certainly downtown development has a place in the city’s renewal but there are other avenues worth considering too. 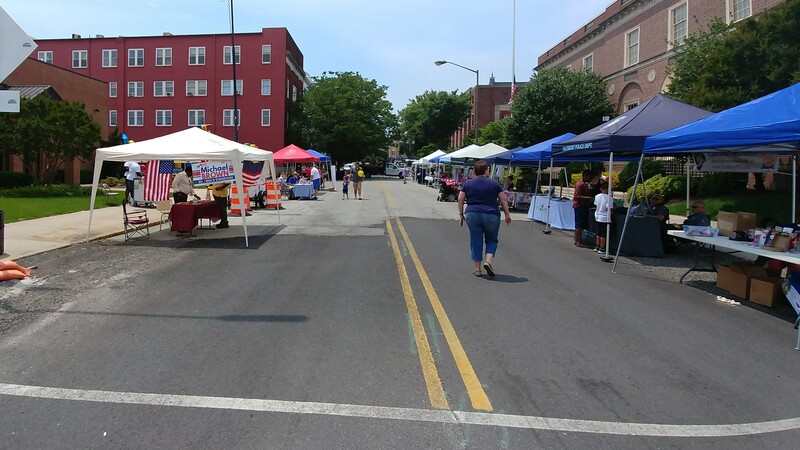 Granted, downtown revitalization was Pillar 1, Strategy 1 of his original vision for Salisbury from two years ago but there are about 95% or more of the city’s residents who live in the rest of the city so their needs have to be kept in mind as well. Another question I have is what will become of the “rain tax” he and most of the rest of City Council (save District 3’s Jack Heath) voted for last year. What specific projects will the money go to, and is there a point when the job will be completed, negating its need? I understand he has a multi-decade goal in mind, but there are a lot of blanks instead of answers on how to get from point A to point B. One thing the Daily Times story alludes to is the possibility of a race between Day and current Mayor Jim Ireton; however, I don’t see that happening. The simple reason is that if Ireton wanted to secure another term he would have made his intentions known already. I know we have more than a month before the filing deadline but the word on the street is that Ireton wants to switch jobs with Day and run for a County Council seat in his District 4. If it’s a race between Ireton and Day for mayor, certainly the city would be better off with the more even-keeled Day at the helm. Ireton’s bullying style is wearing thin. But I want to keep my powder dry for the time being and see if a more conservative, business-minded candidate emerges. So don’t include me in the hoopla surrounding Day just yet. 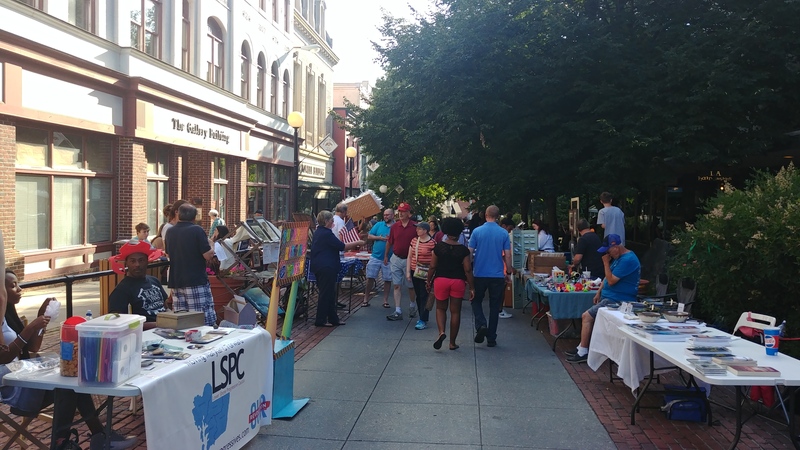 Author MichaelPosted on July 8, 2015 Categories All politics is local, Business and industry, Campaign 2015 - Salisbury, Delmarva items, PoliticsTags Campaign 2015 - Salisbury, Downtown Salisbury, Jake Day, Jim Ireton, Salisbury City Council1 Comment on A new Day in Salisbury? That, in a nutshell, was the story of my Third Friday. I got home from work, changed my clothes, and walked out to my car. Felt a sprinkle, pulled out my phone, looked at the radar picture and saw this tiny orange, yellow, and green blob arriving. Man, did it pour when I got downtown. I walked through a river to get there as people were scrambling to get their treasures under cover. So by the time I arrived it was pretty much cleared out. At that point I decided to find my Delegate’s new office. It’s a modest little room above Roadie Joe’s downtown, but he had some good folks in there for its grand opening: County Councilmen Larry Dodd and Marc Kilmer stopped by as did Salisbury City Council candidate Muir Boda, who made it official today as he filed. I didn’t get a very good picture of the Carl Anderton district office, but my friends Jackie Wellfonder and Julie Brewington did. Find them on social media. They did about the longest version of “Hey Joe” I’ve ever heard. I don’t drink all that fast but I swear I drank half my beer during the song. Luckily, I like the tune so it worked. But as people drifted off to other locales like Headquarters Live, I took a few minutes to stroll the Plaza. The sky was still rather turbulent as I left. It’s funny because Kim was in Ocean City this evening with the kids (daughter and friend) and it looked nice and sunny there from the video I saw. Welcome to Delmarva, huh? From what I heard, though, 3F was rather packed before the rains came. So it wasn’t exactly the Third Friday I planned but it was nice to catch up with some old friends nonetheless. Author MichaelPosted on June 19, 2015 June 20, 2015 Categories All politics is local, Business and industry, Campaign 2015 - Salisbury, Delmarva items, Personal stuff, PoliticsTags Carl Anderton, Downtown Salisbury, Larry Dodd, Marc Kilmer, Muir Boda, Third Friday1 Comment on Increased popularity. Decreased sunshine. It wasn’t my personal campaign, but having a couple political events scheduled the same day and a few extra dollars in my bank account (thanks to new advertisers) allowed me to make some of these gatherings and assist these great candidates. For example, District 38B candidate Carl Anderton, Jr. held court downtown at Main Roots Coffee with a few supporters and friends. It was a relatively intimate gathering as it served as a way station between a parade in Mardela and door knocking in the morning and an afternoon Vietnam veterans event in Salisbury. The parade was the beginning of the day for these two candidates, Christopher Adams of District 37B (holding the Coke) and District 2 County Council candidate Marc Kilmer. You’ll see Marc again in a few paragraphs. Carl made sure to thank me for telling the truth about the MSEA Conway/Mathias flyer, although another attendee brought up the irony that the budget Conway and Mathias voted for also robbed millions promised to teacher pensions. The discussion was interesting and it allowed me to meet and speak with a person I’d not previously met who is a fan of this site. I also spoke to Jackie Wellfonder, who introduced me to Tweetdeck. Maybe I’ll start making heads and tails of Twitter now, although the 140 characters is a problem for me. Consider that the previous sentence was just a little over 140 characters by itself and you’ll see my issue. This afternoon’s event was the latest of a series of coffees Anderton has had at Main Roots, which ironically lies a short distance outside Carl’s crazy-quilt gerrymandered district. But the story isn’t over yet, as I went home for a couple hours before heading over to my Central Committee cohort Bob Laun’s new place to be greeted by this spread. I’m told that Bob and his lady friend prepared it all themselves. Complements to the chefs – it sure beat rubber chicken. 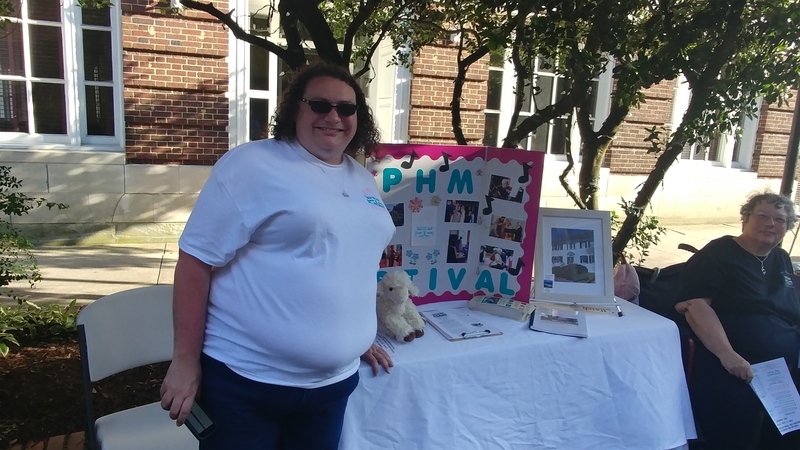 Unlike some other fundraising events, there weren’t formal remarks by the host – instead, Marc smartly circulated between the gatherings which naturally sprung up in various areas inside and outside the house. Having two young children to look out for helps in that regard as well. I did catch up to Kilmer, who’s on the left in this photo, with host Laun in the center and Delmar Commissioner Bunky Luffman on the right. Bunky is Anderton’s campaign manager so I saw him at both events, too – same goes for Anderton, Shawn Jester, Jackie Wellfonder, Christopher Adams, and Muir Boda. As I noted, many of those there had also been at the Mardela parade in the morning, so we were regaled by tales of several candidates and how they fared there. While there wasn’t anything earth-shattering said at either event, I did get a good quote from Anderton at his coffee. We were discussing how I was frustrated about Larry Hogan’s reticence to address more than a few issues, and I noted I wasn’t a one-issue guy. Carl isn’t either: “I’m not a one-issue guy, I’m an eighty-issue guy,” he said, referring to the number of tax and fee increases we’ve endured over the last several years. And while it’s not necessarily related, watch me tie this in to my point. I was walking over to Main Roots from where I parked down Main Street, when I saw this development. If that building looks familiar to my readers, let me remind you of where I was on a Third Friday two years ago. Ironically, I wrote then about another failed restaurant that begat yet another failure before its current iteration as Roadie Joe’s. But we face a choice this year. Surely the owner of this new enterprise has tied his dreams – and probably a fair share of borrowed money – into this forthcoming restaurant, slated to open in June per this piece at the One Salisbury blog. (That’s how I knew to look for it.) There’s no doubt the business will sink or swim on the quality of its food and service, but the question is how much of an incentive or boost can the state and local government give this entrepreneur by assisting him as needed, staying out of the way the rest of the time, and not penalizing him if he’s successful by punitive taxation? After all, he could have just as easily opened in Delaware. If we stay on the same old path we’ve trod over the last eight years, it’s likely to act as an economic headwind which will make success far more elusive. But going in a different direction might just open the door enough for him to break through and make Echelon a success. Those candidates I supported today – and other conservatives of like mind – will be the ones who can help him be successful if the other ingredients are present. I had to be there early to help set up our space, so I happened onto the annual firemen’s awards. It’s always neat to see Old Glory raised up this way. Once the firemen were finished, the color guard paraded to the intersection by which I was standing. Having helped to set up our place (after the mixup we had was resolved) I first wandered the Plaza looking around. A staple of the Salisbury Festival is its emphasis on artistic forms of all sorts. A number of craftsmen and artisans had set up shop hoping to make a little money from their efforts. But it was slow going on the far end. 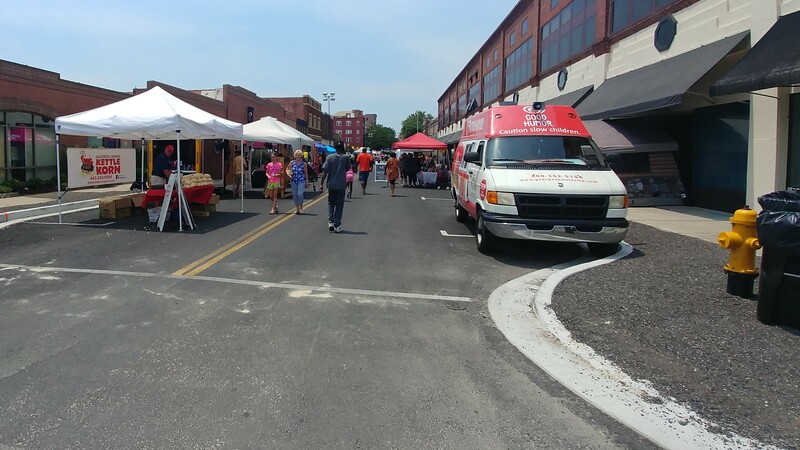 This is the same locale where just a week and a day before Third Friday had set up shop outdoors for the first time this year. Art of all sorts was on display, with an emphasis on the youngest attendees. Many of them were hard at work chalking the Plaza at its entrance. There were also performers on the Plaza, trying to instill us with culture. Talented as they were, for me they were no match to the appeal of Detroit iron. For those of you under around the age of 35 – notice something missing in this picture? Yes, the Corvair was a rear-engine vehicle which was rather popular back in the day until Ralph Nader killed it. It certainly wasn’t all that expensive. It’s also fun to see what restorers go through. This was an unusual display for a car show. But from this shell may come something which looks a lot like this. For all I know, these cars could have been on the line at the same time – both are 1968 Pontiac Firebirds. Yet I’m now of an age when the cars of my childhood are joined as “classics” by the cars of my formative years. Believe it or not, this car is nearly 30 years old – but I drove a similar model in my drivers’ ed class. And I wasn’t the only one walking down Memory Lane, er, Main Street. Now something I skipped in my little narrative was the block or so between the Plaza and the car show. That was fraught with fun and frivolity as well. I talked about this group awhile back, and the local chapter of Move to Amend was out adding to the minor amount of political goings-on. I had an interesting discussion with the guy, but obviously our end goals are different: he wants to erode the power of corporations in government by stifling their rights to contribute money (which, to me equates with their right to free speech.) I’d rather just limit corporations’ power and influence by limiting the size and scope of government. Of course, this guy made the classic mistake of assuming I wanted no government. Speaking of people who make classic mistakes, the Democrats were mixed in with a group of private interests. I thought they should have been next to Move to Amend. One piece of advice I gave to my Democratic friends: Tootsie Rolls and warm, sunny days do not go well together. But they were right across from one of the two City of Salisbury setups, where my Council member Laura Mitchell was sitting. I should have asked if she was going to sit on the other side of the street, too. But I was getting hungry and decided to check out the food court. I was also wondering where my fiance was. You know, it really helps to turn your phone off silent when you are done with the event you turned it off at. Turns out she (and her daughter and friend) were down by the river, where I took this shot. It was empty at the time, but this lot on the other side from downtown is where the Salisbury Festival hosts many of its evening activities. Later on Saturday there would be an international beer festival. I almost took a photo of the rockfish I had for lunch, but I decided not to share. Now when you have kids in tow your priorities change a little bit. Normally I would pretty much ignore the carnival portion of the SF, but that doesn’t happen with two teenagers. A few rides, a basketball and couple (live, in a plastic bag) goldfish later, they were happy and Kim and I went our separate ways as I relieved a relieved Jackie. The Plaza was abuzz with activity by then. Meanwhile, we soldiered on in our modest little space. The biggest problem, as it turned out, was having our tent banner paired up with a small table. We made it work. The final photo is of two presidents: Ellen Bethel of Republican Women of Wicomico and Jackie Wellfonder of the Wicomico County Republican Club. It was nice to see our downtown alive and vibrant for a day, at least. Come Monday after 5 it will be back to its sleepy self, save for a couple pockets of activity. I think the attendance was pretty good as the weather was arguably about as perfect as someone can ask for. I took this shot standing toward the west end of the Plaza looking east. Noteworthy is the fact the west end of the Plaza is usually not all that busy on Third Friday. It’s the more sedate side of things, like this gallery shows. I wonder, though, why it’s Gallery 101 when the building is 224 West Main? But good weather brought the crowd farther down. That and free snow cones at the Carriage House. While I appreciate that John Robinson has made an effort to bring a successful business to downtown, I have to quibble with the sign. Don’t leave it up to the politicians to create a skate park because I don’t think that’s a necessary function of government. John seems to be good at finding markets and ways to fill them, so why not secure a nice piece of property and do it right? Where the politicians can help, though, would be figuring out ways to expedite the process for all those who want to develop. A twist to this month’s edition was the inclusion of the Wheels that Heal car show, although it was a more modest version than the one normally held at the Salisbury Festival. Of the classics parked there, this 1961 Chevy Impala was my personal favorite. My parents owned the 1960 Impala model when I was a wee lad. It’s amazing to see the differences between consecutive model years back in that era compared to now, when body styles tend to last three to four years without much change. The other car I liked down there wasn’t parked on Division Street. This owner wanted to shine on his own, I suppose – but it’s a sweet street rod. Notice there’s no back seat for the owner had wide racing slicks for the back tires. Back on the Plaza, this shot was more representative of the gathering. It was taken about 7:00. I just liked the pop culture reference on my friend Chris Lewis’s sign. By the way, the chicken salad IS really good. I didn’t have it Friday night, but I have tried it before and I can vouch for it. Yet I can’t necessarily say it’s the best on the Shore because Kim’s mom makes a pretty mean chicken salad, too. In case you’re wondering, I did check out at least a little bit of the three bands set up there, and that’s an upcoming Weekend of Local Rock post. 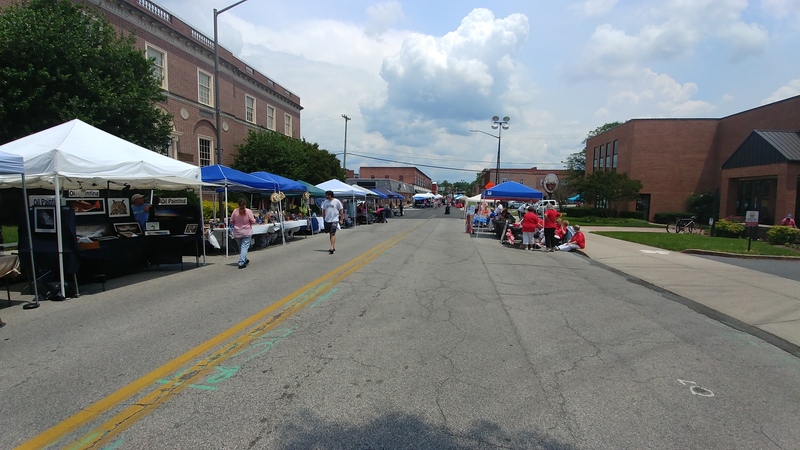 Until I see a Plaza which looks like the Plaza does during the Saturday of the Salisbury Festival, I’m not sure I can call the event a true success. Since we’re not what one would call a tourist attraction (aside from having the Shorebirds) the support may have to come from within. We have a lot to offer, but need more to come and take advantage of it. 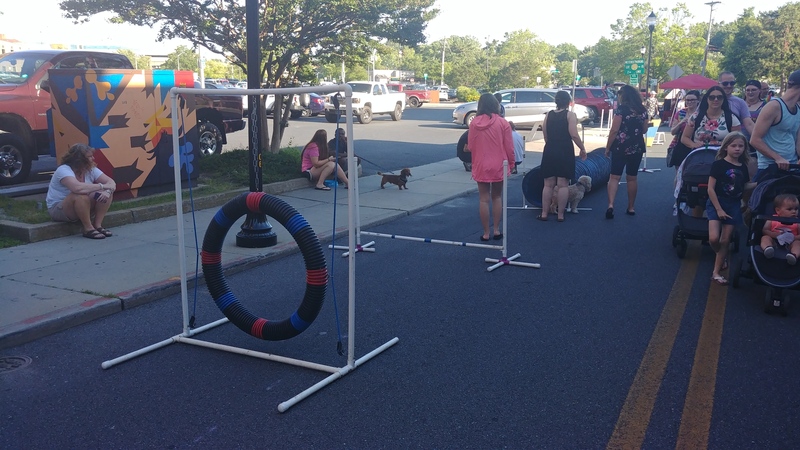 For some time, the city of Salisbury has highlighted its downtown Plaza one day a month, as the powers that be chose the third Friday of each month for the event. As they promoted their new logo, it was my first opportunity to enjoy the festivities. Normally I’ve had one of two conflicts: league bowling or a Shorebirds game. Since neither was in effect Friday night, my significant other and I went down to see what it was all about. It was a sort of sparse crowd when we arrived, as folks were just getting set up. This picture was taken just before 6:00 and, as you can see, there wasn’t much going on. The local artist whose professional moniker is “Y-Hate” was making the rounds with a bucket of mud. Why? To do these temporary sidewalk paintings. They’ll be gone and off to the storm sewage system with the next good rain; ashes to ashes and all that. The second picture was taken roughly 6:45 and you can see business picked up a bit. I guess when the Third Friday concept was hatched, it was based on the “Arts on the Plaza” portion of the Salisbury Festival. Just like at the Salisbury Festival, 3F was promoting themselves at this event too. Indeed, there was an art show indoors at the building which used to house the Escape restaurant (more on that building later.) I didn’t get any pictures of the artists’ work, but I did scope out the shows. Also, there was music. Ben Rayne is a guitarist who picks out a location in the Parker Place lot and sets up most warm months. Yet he wasn’t among the ‘featured’ artists. J Guy and Carter were the two acoustic musicians set up on the makeshift stage in front of the WMDT-TV studios. Meanwhile, way down the street at Flavors one could find the acoustic sounds of Goatbag vocalist Josh Pryor. Unfortunately, I wasn’t aware he was playing until after he was finished. But I imagine it was a departure from his other job singing with what could be best categorized as the goth metal stylings of Goatbag. And that leads me to my first complaint. Maybe it’s because I’d not been to Third Friday before, but my perception was the activities would be conducted within the Plaza and perhaps a bit around the corner. Maybe these signs were a bit confusing. Then again, it pointed into the Plaza. 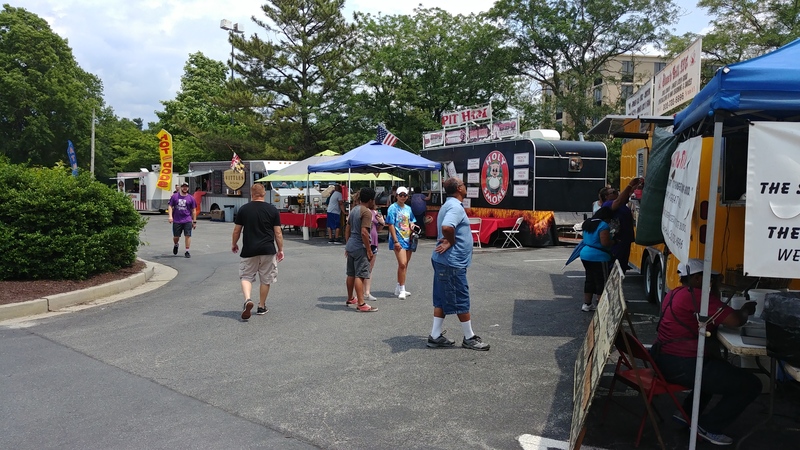 But other vendors were farther down Main Street and I had no idea until I wandered down to the Flavors end of the block. That’s where I found this guy. He was holding court in Flavors, and was nice enough to pose for this shot after briefly discussing the disagreement between a $78 parking space and a $100,000 condo before retreating inside to reunite with his rapidly-warming beer. As I mentioned last night, both featured artists were selling their wares. Yet that’s a serious omission if done with enough volume. And speaking of sales and songs, peace sells – but who’s buying? I had a brief disagreement with one of the women handling this table because she had a flyer that claimed 39 cents of each federal dollar went to fighting wars and handling veterans affairs. This pie chart by the Concord Coalition begs to differ. Sure, I know, to these guys 20 cents out of a dollar is too much, but we do need to “provide for the common defense” somehow. Let’s go back to the pretty pictures, shall we? Again, the crowd managed to increase as the evening wore on – I took the top one about 6:30 and the bottom about 8:00. One nice thing about the Plaza is the photographic opportunities different lighting scenarios provide. Obviously the focus of the event is on the arts. So what were these ladies doing here? Promoting their upcoming matchup, of course. Then again, this poster does have artistic elements in it. I could see that hanging in someone’s den, particularly if they’re interested in sports memorabilia. Keeping my promise of earlier in the article, I wanted to share something I noticed about the Escape restaurant. It almost looked like the Rapture hit there a few months early. It sort of creeped me out that the place looked like it was ready to open for another night’s business, as if the owners expected to be back later that evening and never arrived. Maybe that’s intentional (because who needs to see yet another obviously vacant space downtown) but the care didn’t extend outside the building. It’s a place begging to be a musical venue but no one was there. While I was down there, I spoke to one business owner who’s attempting to solicit financial support for a second day per month where downtown stays open through the evening. Some have even suggested we do this every Friday night, but I don’t think the concept would last if done too often. The way I see it, what makes Third Friday work to the extent it does is the fact it stands out from the other days of the month. It seems to me that the concept could be expanded to a second day of the month only if the weather is conducive for strolling (as it was on Friday) – in the wintertime this may not be enough of a draw to convince people to leave their homes for an event with multiple indoor venues. My other suggestion would be to simply put out the information on where musicians are playing and artists are setting up. Had I known Josh Pryor was down at Flavors I may have wandered down to hear a few songs. Like this article in spots, Third Friday has a certain disjointed character which may appeal to some but not others. Since I’m not really a member of the arts-and-croissant crowd, the main draw for me would be the music so I want to know who’s playing where. I’ll likely drop by next month to see what’s new and unusual, so why not do so yourself? The Plaza looks better with a few hundred people in it than it does when it resembles the vacant patio of Escape. Obviously there’s a lot to do in the summer, what with Shorebirds games, various festivals, and the draw of Ocean City nightlife, but it wouldn’t hurt to take a little time and support some local businesses either. Once the crowds come down, the buzz will follow and the event will kick into a higher gear. The next Third Friday is June 17. There is no Shorebirds home game that night, festivals usually run two nights, and Ocean City isn’t going anywhere. You have no excuse.